The music industry has produced some iconic female artists in recent years. From princess of pop, Kylie Minogue, through to the eccentric Lady Gaga, these modern day divas belt out hit after hit for our entertainment. 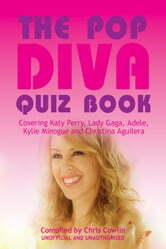 If you are a fan of powerful female singers, you are certain to enjoy The Pop Diva Quiz Book. Which American singer-songwriter was heavily influenced by gospel music when she was growing up? Which award-winning artist attended the BRIT school in the UK? Which singer released an album called ‘Back to Basics’ in 2006? The answers to these brain teasers and more can all be found inside this book. Featuring five multi-talented female artists; Katy Perry, Lady Gaga, Adele, Kylie Minogue and Christina Aguilera, you are sure to learn something new about your favourite diva. With 100 questions on the women who have helped to shape the modern music landscape, this book will appeal to pop fans of all ages. Find out how much you really know about some of the most influential women in pop. Ariana Grande: Fun Facts, Stats, Quizzes, Quotes ‘N’ More!